Dressing room within the bedroom is probably a dream of many women. This tradition started its expansion from America. In general, I must say, the problem of clothes storage is relevant to all, and arrangement of complete dressing room is the dream available not for everyone. 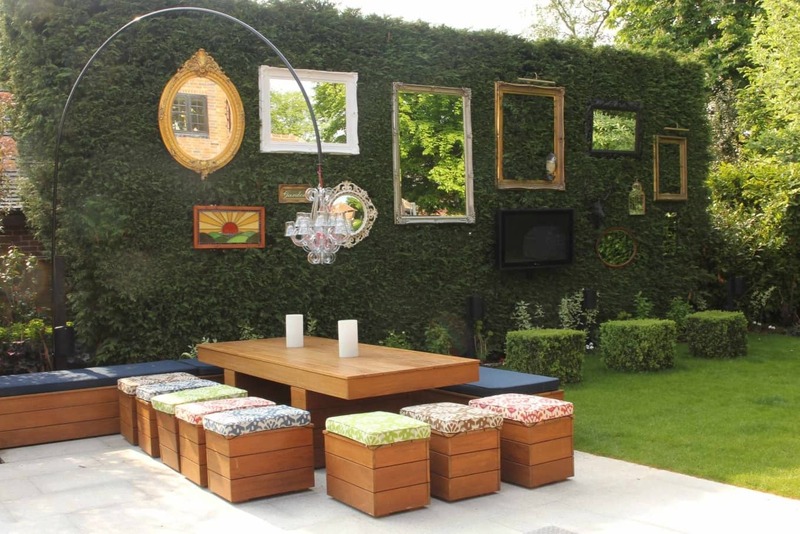 Moreover, in the classic sense, it has to be room, fenced with wall or a sliding partition. But version of the open dressing room, equipped with racks` system for clothes, underwear and shoes is widely used today. 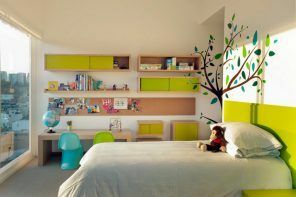 So, let`s take a look at your possible dream bedroom wardrobe decorating ideas on the photos from all around the globe! 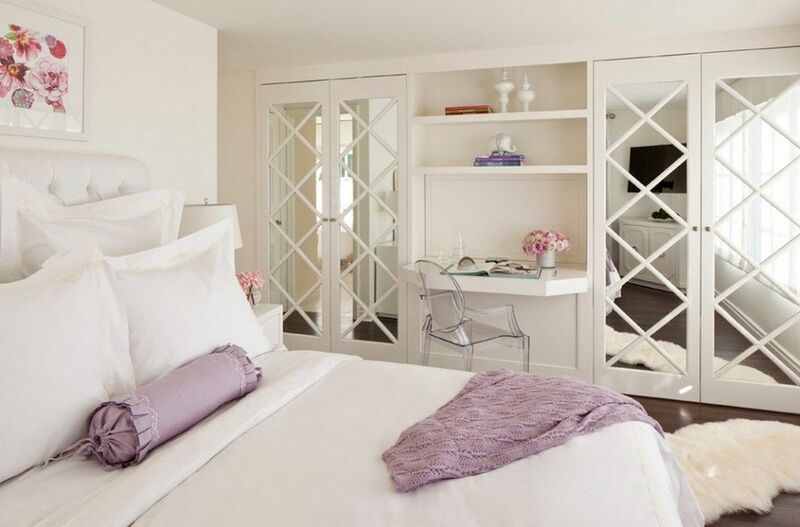 If space allows, it is possible to change clothes in your in-room wardrobe and/or to equip it with mirror. As the dressing room, first of all, is the epitome of taking care of things, the desire for order and comfort and not a whim or a tribute to fashion. 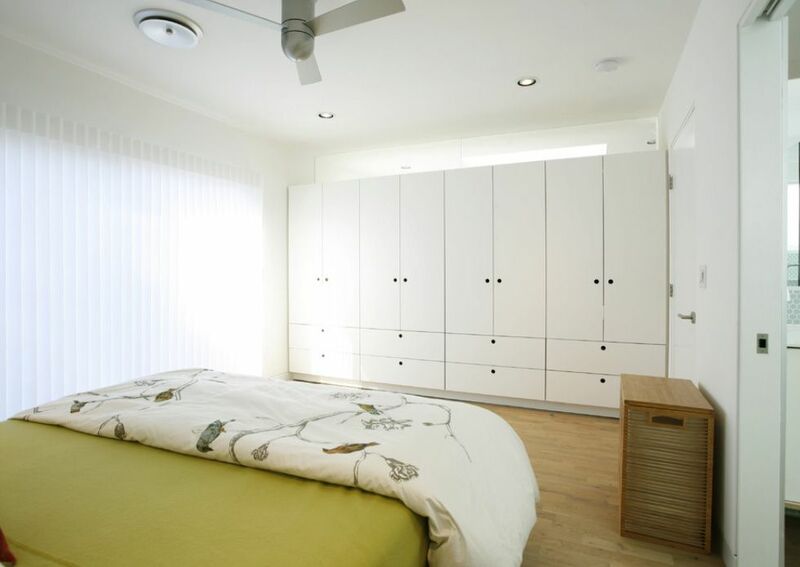 At present, there is an increasing tendency to arrangement full wardrobe in the bedroom instead of traditional cabinets. 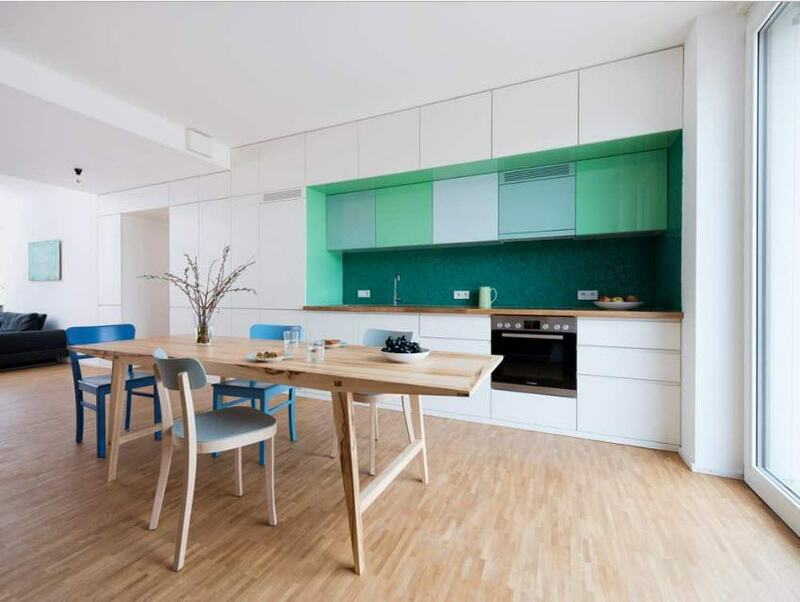 Moreover, it can be implemented regardless of the area of ​​the room. Even in a small bedroom, if you choose rational and thoughtful approach, you can save a lot of place to organize dressing room instead of the buying a cabinet. 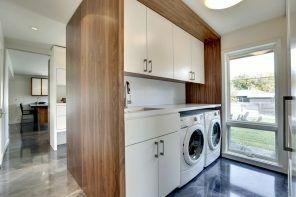 Especially because in this case it is possible to take virtually all the space from the floor to the ceiling. So, the benefits are obvious. 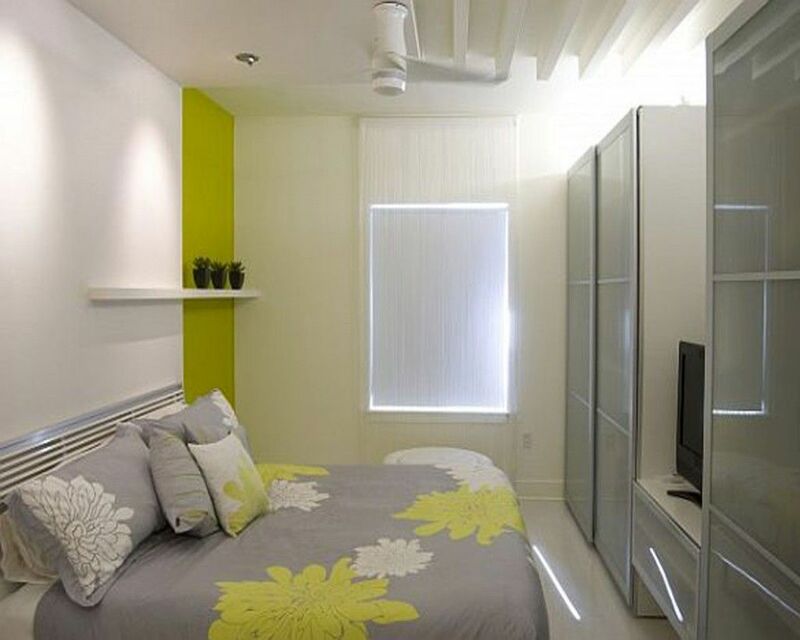 Bedroom is best suited to this of all rooms, because all the things would be at your hand. Moreover, it will be possible not only to store clothes and linen, but also household items such as iron, folding ironing board, and maybe even a vacuum cleaner. After all, the main purpose of dressing room arrangement is to bring all the necessary things into order, and to hide the ones that are not desirable to be exposed to the outsiders. In what exactly place is the dressing room to be? A placement for the wardrobe can be a niche in the bedroom. Alternatively it can be positioned along the longest wall. A dressing can be arranged in one of the room`s corners so that the headboard rested against one of its walls. The bed should be set diagonally for this, thereby releasing the angle. It`s a good saving space option. In the standard scenario, the built-in dressing area should be occupied entirely by shelves and hangers, as well as shelves for shoes, devices for ties and belts, etc. You could also put the ottoman or chair to change clothes and shoes – that`s all a matter of taste and your imagination. 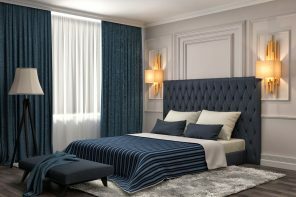 But the most cost-effective way in terms of financial costs is perhaps the installation of cornice or rod under the ceiling, where hang heavy curtains made of thick fabric and in the form of spectacular falling draperies to the floor. Thus we solve the problem of separating the bedroom into two zones. What design of wardrobe to choose? There are many design solutions in this area. Let us stop on some of the most optimal and common variants. For example, if the area of ​​your bedroom is small, a mini-version of the dressing room will suit you. It accommodates everything you need and will not take up much space. If you use a corner dressing, it does not necessarily be a separate room. Usually it has a look of a mere cabinet and is located in a place where nothing of furniture can fit. Thus, it looks very capacious and functional, despite it takes up little space. 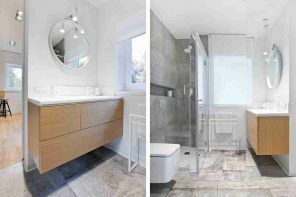 In this connection, this option is perfect for small bedrooms. 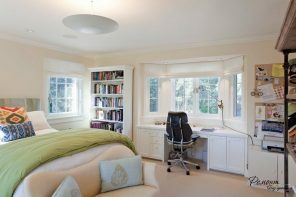 If the bedroom is located in the attic or loft, there is much more prospects open for the realization of your dreams, because there are many design options appear at once. For example, you can place the bed at the sloping walls, and arrange a dressing along the high one. Herewith, making a sliding or “accordion” door would be a good idea. By the way, these doors are very convenient as they move along the guide rails separating the free space from the wall over the entire length of the bedroom. And if you equip the front door mirror, such a dressing room will not only unload the space, but on the contrary, visually expand it, and at the same time securely hide all necessary things from the sight. What should the light be? Lighting undoubtedly should be bright to avoid distortion of clothes color and make-up tones. You should always have the ability to find the right thing and to assess its condition quickly. If natural light is not enough, the special attention should be paid to good artificial light. At the same time, clean ceiling lamps will not be enough. In any case, you need additional lights, for example, built on the ends or on the bottom of dressing shelves. Fluorescent light is also perfect as a light for the dressing. As here you can not only change clothes, but also undress before going to the bathroom, it was entirely superfluous not to take care of the laundry basket. A cozy fluffy carpet wonderfully complement the interior, especially since it’s so nice to stand it bare feet. And, of course, the dressing room should repeat the color of the bedroom and be fully in harmony with it. It is the first thing you should not forget about.